Cloud shadows are found to influence shallow cloud size and water content. Shallow clouds over land are usually only several kilometers wide and rarely produce rain, but their shadows influence the exchange of water and energy between the land and the atmosphere. Enlarge Image. 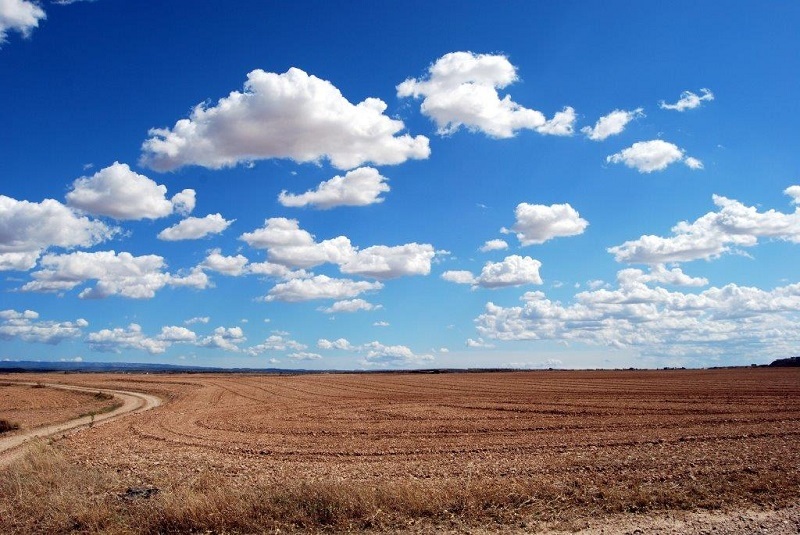 Shallow clouds over land are usually only several kilometers wide and rarely produce rain, but they are numerous and quite effective at blocking the sun and modulating evaporation of water from the land surface. It is important that Earth system models accurately take into account the effect of these shallow clouds on the exchange of water and energy between the land surface and the atmosphere. A study by researchers at the U.S. Department of Energy's (DOE) Pacific Northwest National Laboratory showed that shadows from shallow clouds create surface variability that affects the growth and evolution of the shallow cloud population itself and the exchange of water and energy between the surface and the clouds. Furthermore, the researchers found that the angle of the sun largely influences the way in which cloud shadows affect the exchange of water and energy between the surface and the clouds. This study shows the need to accurately consider the effect of shallow clouds and their shadows in atmospheric models used to simulate weather and climate. It could help guide improvements to the representation of shallow convection in Earth system models. To improve predictions of Earth systems in response to environmental changes, researchers must take into account massive amounts of data across space and time. A key component of this puzzle is the role of the small yet energetic eddies that are not represented explicitly in state-of-the-art Earth system models. Researchers performed large-eddy simulations—high-resolution numerical simulations that explicitly resolve these energetic eddies in the atmosphere—of continental shallow clouds observed at the DOE Atmospheric Radiation Measurement (ARM) user facility's Southern Great Plains (SGP) atmospheric observatory. The large-eddy simulation domain was embedded inside a coarser-resolution domain and coupled to an interactive land surface model to accurately simulate the conditions over a range of different spatial scales. The large-eddy simulations used very high spatial resolution (100 meters), and their domain size was comparable to that of a typical Earth system model grid box (30-100 kilometers). With this setup, researchers could explicitly model shallow clouds, their shadows at the surface, and other small-scale surface features (e.g., crop patches). By comparing simulations with and without small surface features, researchers could estimate their effect on the mean cloud properties. They found that the cooler surfaces in the cloud shadows influenced the circulations around the shallow clouds overhead and affected the size and water content of these clouds. Furthermore, the angle of the sun in the sky played a large role in this process due to its control over the shadow relative to the cloud. Sponsors: The U.S. Department of Energy (DOE) Office of Science, Biological and Environmental Research, supported this research as part of the Atmospheric System Research program. User Facilities: Data were obtained from the Atmospheric Radiation Measurement (ARM) user facility, a DOE Office of Science user facility managed by the Office of Biological and Environmental Research. Model simulations were performed and archived at the National Energy Research Scientific Computing Center (NERSC), a DOE Office of Science user facility.